I’ve made a video for you as I made up the rose petal jam. View it here. When I was in year 12 at school, I won a book prize. I chose two books from our local newsagent in Moe, Gippsland. (We didn’t have a bookshop in that country town). I popped into the newsagent after school for several days in a row, trying to decide which books I’d buy with my voucher. Finally, I decided upon a book on embroidery and one on growing and cooking from an English garden. I still recall leafing through the book and stopping at the elderflower champagne and the rose petal jam, wondering if I’d ever taste them. They were so delicately appealing yet almost impossible to ever taste. A bunch of fragrant roses ready for jam. Years went by and my first trip to England found me haunting shops and pubs, drinking anything made from Elderflower that I could get my hands on. 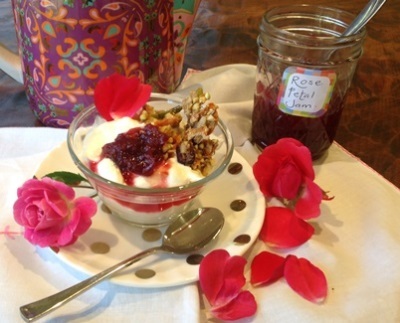 It was in Yorkshire, in a small hotel, that I tasted my dream… home-made rose petal jam. Ah, I can still remember the breakfast. Latherings of the dark, red rose petal jam oozing over a warm scone. It was still winter outdoors, and frosty as all get out. Snowy too in the cooler valleys. You can see a picture of me in my warmest gear back then. It was warm and snug inside with a fire roaring in the breakfast room. That jam was like tasting spring. All the fragrance of a fresh rose in a beautiful, soft, sweet, mouthful. I’m sure my husband Damien couldn’t quite get how wonderful it was, but I was in heaven. 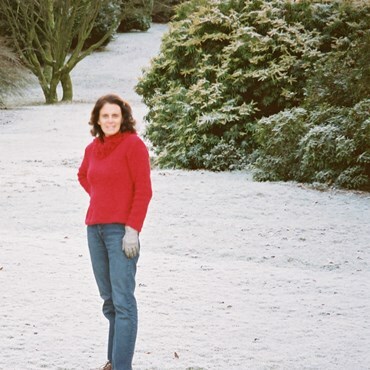 Enjoying the snow in Yorkshire after a rose petal breakfast scone. Fast forward many years and we come to autumn 2017. A couple of friends gifted me with bunches of fragrant roses, organically grown in their gardens. That smell instantly transported me back to Yorkshire. It was done! I had to make the Rose Petal Jam once again. So, I’d love to share this recipe with you. You might be romantically inclined after a mouthful of this jam… Beware, it’s scentsual. Don’t skip any of the steps below. They are all essential for the best jam. 200 grams fragrant red or pink rose petals. They must be organically grown. 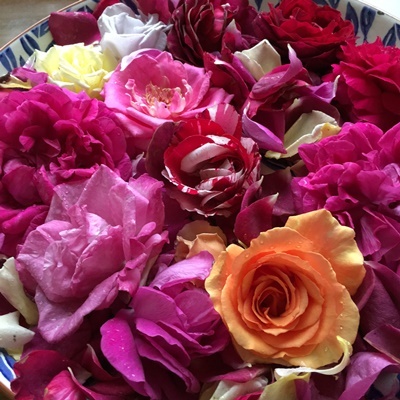 Pull the rose petals from the stems and collect them in a large bowl, discarding the stems. Add 200 grams of the sugar and reserve the rest. Massage the petals with your hands until they are soft and starting to release juice. The fragrance wafting up from that bowl will be intoxicating! Tip the rose petals and juice into a saucepan. Stir in the lemon juice, the rest of the sugar and the water. Simmer gently for 20-30 minutes until your rose petals are soft. Add the Jamsetta and cook a further 5-8 minutes. Remove from the heat. If you have chosen to add the rose water, now is the time to add it. Stir it through. Now you are ready to bottle the jam. Tip it into clean and warm sterilised jars. Seal and store if you can. It will be lightly set and simply divine.